Since airing, TVB anniversary drama OMG Your Honour <是咁的，法官閣下> has been well-received, with viewers praising the plot, casting choices, and other aspects of the production. 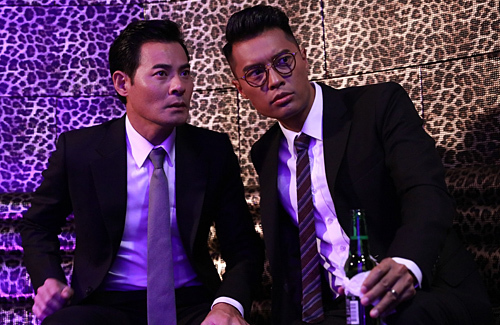 While a key highlight of the drama are the juicy court tussles and verbal exchanges between opposing senior counsels and frenemies Ben Wong (黃智賢) and Eddie Kwan (關禮傑), the performances of the “newbie lawyer gang” members played by Jackson Lai (黎振燁), Hugo Wang (黃子恆), Johnathan Wong (王梓軒), Louisa Mak (麥明詩) and others have also made a good impression upon viewers. Among them, Jackson, who plays Ben’s junior in the series, impressed due to his standout muscular physique and natural on-screen delivery. 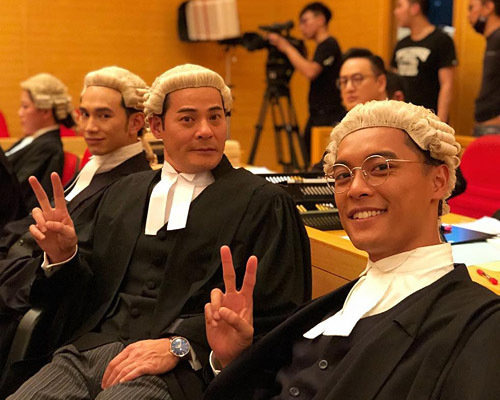 In an earlier video released on TVB Facebook of the drama’s behind-the-scenes footage, Ben is seen making blunders in “court” despite it being his third time playing a lawyer. The actor, who is usually stern, shows a cheeky side of himself after screwing up his lines. The newbie lawyers gamely set a rule that whichever actor who had to do retakes would have to give everyone a lunch treat. In his cafeteria scene, Jackson had to do at least five retakes before successfully completing his lines, as seen in the hilarious video. As to why he had so many hiccups delivering his lines, the actor explained that it was not the scriptwriter’s fault at all, as she had done an excellent job. The main reason was that he was not focused enough, plus the fact that he was playing vastly different characters in various dramas around the same time made it all the more challenging. He would continue with his lines while thinking that they flowed smoothly from the previous lines, only to realize that he had in fact made a mistake. Laughing, Jackson added that he had almost finished serving his “punishment” of lunchtime treats for the cast. Sharing his filming experience in the anniversary drama, Jackson mentioned how the new cast collaboration made for a madcap time on set as everyone was spontaneous, and any scenes with Oscar Leung (梁烈唯) would be especially fun. When asked about which of the cast had the most potential to become lawyers in real life, he singled out Johnathan Wong, and later added that everyone but himself was suitable due to their quick on-the-feet thinking and fast reactions. For his role, Jackson earned a place in the list of nominees for TVB Awards’ “My Favorite TVB Actor” in the Malaysia/Singapore region. He is thankful for viewers’ support, and credits his acting partners Ben and Hugo, from whom he has learned much during filming. “My biggest worry was that viewers would not be able to accept my delivery of the role. Their acceptance is the biggest encouragement to me.” Flattered to have been nominated, Jackson said with a laugh that he is “100% certain” that he would “have nothing to do with the award” and would be surprised if he won, as he feels he is too much of a novice at this stage. Nevertheless, he is extremely thankful for the recognition and hopes that either Ben or his co-partner Hugo would win (Ben, Eddie, Hugo, Oscar and Jackson are all nominees), and would be most delighted if OMG, Your Honour clinches Best Drama. Struggling in his acting career earlier, Jackson recently gained attention with as a hot-blooded foreman in TVB drama, Another Era <再創世紀> and now as a lawyer in OMG, Your Honour. The 32-year-old actor would surely feel heartened by his increasing drama presence and acting recognition. I think this guy got potential.. He even sounds like Louis Ko!! So far decent performance. I have hope in TVB with so many decent young ish leading actors. Poor Oscar Lai, relegated once again to the guy next to that guy next to that leading guy.